This Realm Royale account unban appeal guide also applies for Smite and Paladins ban appeals! Although still in Early Access right now, Realm Royale seems to be the next flavor of the month when it comes to Battle Royale and Survival game genres. Despite not even being released yet, Realm Royale is already in a neck-in-neck race with Fortnite for the #1 spot on Twitch. As you very much know, being a PvP game, Realm Royale is bound to have its fair share of competition. The more competitive a game is, the more prone are its players to take “shortcuts”, or get frustrated or annoyed. More so, when having such a large audience, game developers do everything they can to prevent players from cheating, and more often than not, this can trigger a lot of false positives, which can lead to getting your account banned. 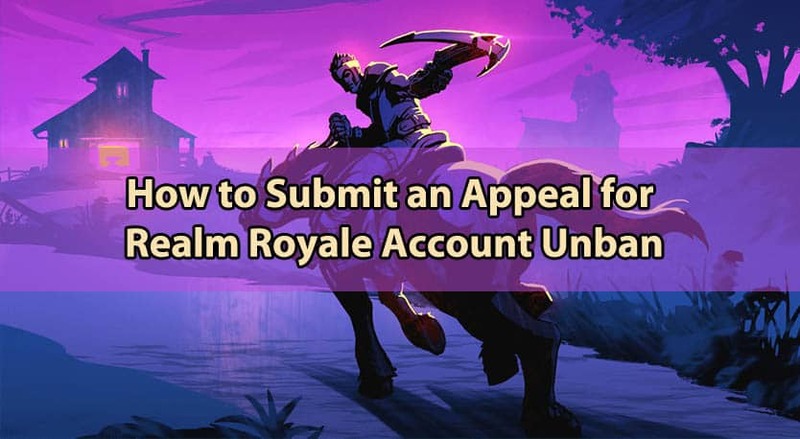 Regardless of the above-mentioned, in this post we’ll explore how to submit an appeal for Realm Royale account unban, which also applies for Smite and Paladins ban appeals, since they fall under the same company. First and foremost, if you got banned in Realm Royale, or any game for that matter, don’t panic! That can’t and won’t lead to anything productive and positive, and reacting on your first impulse can cause more harm than good! Now, for the “Question” field regarding your Realm Royale account unban appeal, that’s where we come in handy, should you require our professional and customized Realm Royale unban service designed to get your Realm Royale account unbanned. 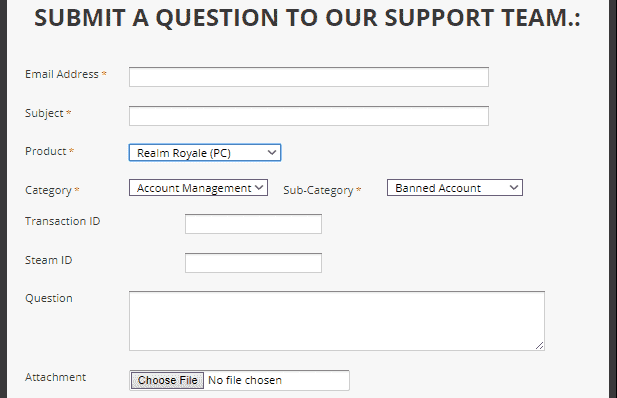 Once you’ve completed the form or the mail for your Realm Royale ban appeal, press the “Submit” button under the form, and your ticket will be sent to their Support! This guide also applies for Smite and Paladins account bans! Now that everything is done, wait until they review your Realm Royale account unban appeal and get back to you with their reply via mail. Also, make sure to check the Spam folder as well! Good luck! Need help with a Realm Royale account ban? We're here to give you the best help in order to get your Realm Royale account unbanned! Get unbanned from Realm Royale!